I don’t know why, but until yesterday, I failed to see a black eyeshadow sitting there in the second row right corner. Perhaps, I was too mesmerized by taupey brown and two variants of gold that the plain black went unnoticed. 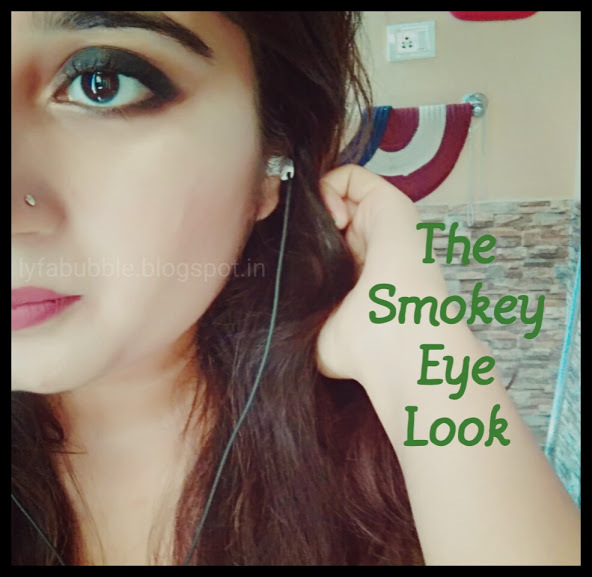 On its discovery, the first thing that came to my mind was to try on a smokey eye look. I am no makeup professional, so if I managed to do it, then it’s definitely an easy beginner’s Smokey Eye Makeup Look. So let’s start, shall we? 1) Prep your eyelid by dotting some foundation/concealer/eyeshadow primer. I’ve used Makeup Revolution Matte Concealer Stick in the shade 01- Fairest. Then lightly dust some compact powder so that the eyshadows can be blended easily. 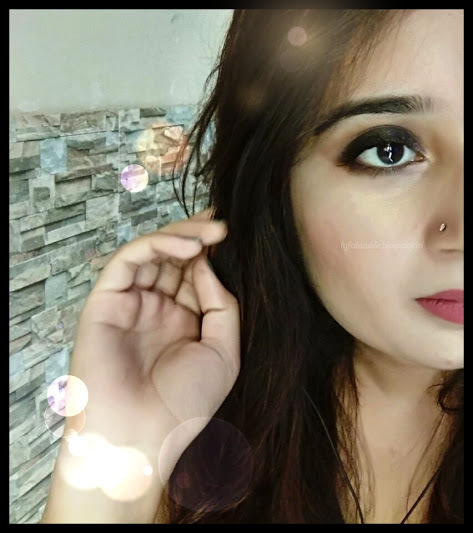 2) To increase the intensity of a black eyeshadow, I first used Incolor Colour Crayon Creme (reviewed here- http://lyfabubble.blogspot.in/2016/06/incolor-colour-crayon-creme-e-01-in.html ) in black colour and started by putting the crayon on half of my eyelid and then smudging it out with Vega Smudger Brush. 3) Next, I used a dark brown eyeshadow from the Maybelline the N*des Palette at just below the crease area to blend the black into brown and soften the edges. In the crease I used the taupey brow colour from the same palette. This would further soften the dark brown and help in providing softness to the black eyeshadow that we used on the eyelid. The idea is to keep the colour intensity darkest near the eyelashes and as it moves towards the crease, the colour goes to a lighter spectrum. 4) I used the first eyeshadow colour from the N*des Palette for highlighting my inner corners and using it at eyebrow bone. You can use your eyeliner pencil again to line the upper eyelids. 5) Lastly, use a mix of black and brown eyeshadow and line your waterline and smudge it slightly to balance the smokiness of upper eyelids.